Great weather and a strong field of drivers put on a great show in all the classes. Six classes had the minimum eight entries to be eligible for the $500 bonus at the end of the day. Austin Elliot, winner of the Senior Rotax class, took home the race bonus when his name was drawn out of the hat. David Arnstein drove one of the best races of his life to come home first, taking the Stock Honda Masters race and with it won the GoPro feature event and the Hero 3 camera. It was an exciting qualifying with Arnstein taking the pole ahead of Jim Inglebright and Rene Martinelli. Inglebright took the early lead in Heat #1 then was never challenged with Arnstein falling back and Justin Bennett overtaking him to take 2nd place. In the second heat, Inglebright again took the early lead with Bennett going into 2nd and Martinelli taking 3rd as Arnstein fell back to 5th with what appeared to be shifting problems. For the Main, Inglebright was on pole with Bennett along side, Martinelli and Arnstein in row two. At the drop of the green flag, Inglebright went to the front with Arnstein getting a great start and getting by Bennett before turn one. Unlike the heat races, Inglebright was not able to pull away from Arnstein. Arnstein stayed on the 2013 class champs rear bumper and made a couple of attempts at a pass. At about mid race distance, Arnstein was able to get the run out of turn one to get under Inglebright at turn two. David was then able to open a small gap so as to avoid a pass attempt by Inglebright. The two front runners then ran nose to tail for the remainder of the race with Arnstein not giving Inglebright an opening for a pass attempt. In the end, Arnstein took what may be his best win at the RLOKC and with it took home the GoPro Hero 3. Inglebright had to settle for 2nd, Bennett came home 3rd, his first podium finish in the series with Nick Major 4th and Martinelli 5th. A strong field of eleven karts took to the track, Clayton Williams took pole ahead of last month’s winner Bryson Lew, with Colin Mullan 3rd. Williams had the lead at the start with Mullan getting by Lew to get behind Williams. These three drivers ran in a close pack for the entire race with Williams taking the win just one tenth of a second ahead of Mullan, Lew less than a second back and Dustin Salaverria taking 4th. The second heat was a near copy of the first heat for the first four positions were. Williams again took the win just two tenths ahead of Mullan followed by Lew, Salaverria and Valdemar Eriksen 5th. The Main started out just like the heats with Williams leading out of the first turn followed by Mullan. Some tight racing lead to some minor bumping as the pack went into the turn three hairpin. Unfortunately Lew had got a tap on his rear bumper, which turned him around thus dropping him to last place. Williams and Mullan then pulled away from the rest of the pack and had their own duel for the lead with Mullan getting by, then Williams retaking the lead. Mullan then got by again around lap ten and was able to hold off any challenges by Williams to take his first ever feature win. Williams had to settle for the runner up spot but increased his points lead in the class. Salaverria came home 3rd with Brennan Stammer taking 4th after a race long battle with Eriksen ended. Eriksen spun off two turns from the end of the race, handing the 5th place position over to Matteo Sandoval. Brian Keck took the pole ahead of the tough field with Carter Williams 2nd and Cabot Bigham 3rd. In the first heat, Keck took the lead at the drop of the green. Keck held a small but controlled lead to the end to take the win followed by Bigham, Williams and Hunter Pickett. Keck took the lead again at the start for heat two and was not challenged as he took the win followed by Williams, Daniel De La Calle and Bigham. In the Main, it was again Keck taking the initial lead with Bigham right behind. The two team drivers started to pull away as the Williams, De La Calle and Picket were battling for 3rd. On lap five, problems overtook Kecks kart and he had to pull off leaving Bigham with a good lead. Last months winner, De La Calle, made his way into 2nd and then started biting into Bighams lead. With only a couple of laps left in the fifteen lap Main, Daniel made the pass to take the lead. Bigham just did not have enough to mount a challenge for the front spot and had to settle for the runner up spot just two tenths of a second behind. De La Calle thus took the win, his second in a row, Bigham 2nd, Williams 3rd and Pickett holding off a challenge from Grayson Browne to take 4th, Browne 5th. 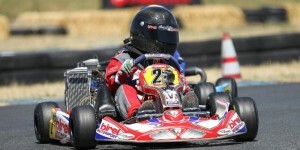 The Jr 125 of Gino Gigliotti came home in 8th place, doing a great job in the lower power kart. 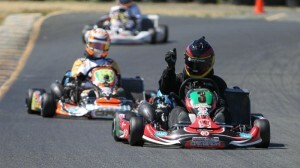 Junior Rotax was again the largest class of the day with thirteen karts. Enzo Prevost continued his speed in the front of the field by taking pole followed by Mason Cohen and Chase Farley. This race saw some of the newer and up and coming drivers start to exert themselves and put more pressure on the drivers up front. In heat one, Prevost took the lead out of turn one after some pressure from Farley with Cohen falling back to 4th. Karts were three wide going into turn two and this action mixed up the field a bit. Prevost seemed to be untouchable, but Cohen made his presence known by moving up from 4th to take over 2nd and then made a strong move to pass Prevost for the lead. In the end, Cohen took a one second win, Prevost 2nd, Michael Michoff 3rd and Annie Breidinger 4th. In the second heat, Prevost had pressure from Farley going into turn one and this allowed Cohen to get out front. Prevost fell back a few spots while Farley eventually dropped back to near the rear of the pack. At the end, Cohen took his 2nd heat win of the day followed by Jason Pettit, Michoff and Prevost. During the Main, the push at the front of the field happened again and this made Cohen slip from 1st to 4th after turn two. Prevost was able to work his way to the front after turn two with Annie Breidinger, Michoff and Cohen chasing. Cohen’s race ended on lap six when he had to pull off with what appeared to be a chain problem. The top three then pulled away from the pack with Farley, Toni Breidinger and Phillippe Denes battling for 4th. In the end, Prevost took his second win of the year just one tenth in front of Annie who broke out for her best drive of the year. Michoff came home 3rd followed by Farley, Toni Breidinger and Denes. 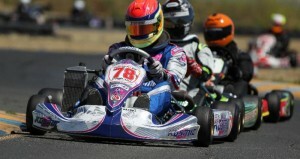 This race group is now becoming known as the Hybrid race, a race for gas and electric karts. 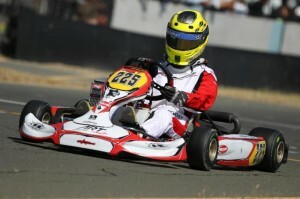 The electric karts were out numbered this race with five Rotax DD2 karts racing versus only four electric karts. In qualifying; Richard Hilleman (EVO) took the pole ahead of Andrew Colombini (DD2), Marcos Ramirez (EVO), and Andre Eriksen (DD2 Masters). A rather unusual start had the DD2 karts taking a green rolling start then the electric karts getting the green some five seconds later where they used a standing start. In the first heat, Colombini took the early lead but had to park his kart on lap 3. Corey Mitchell (DD2) took over the lead to go on to the win, Eriksen 2nd and Ramirez 3rd. In the second heat, Colombini took control of the race from the green flag and went on to a convincing win, Mitchell 2nd, Eriksen 3rd. 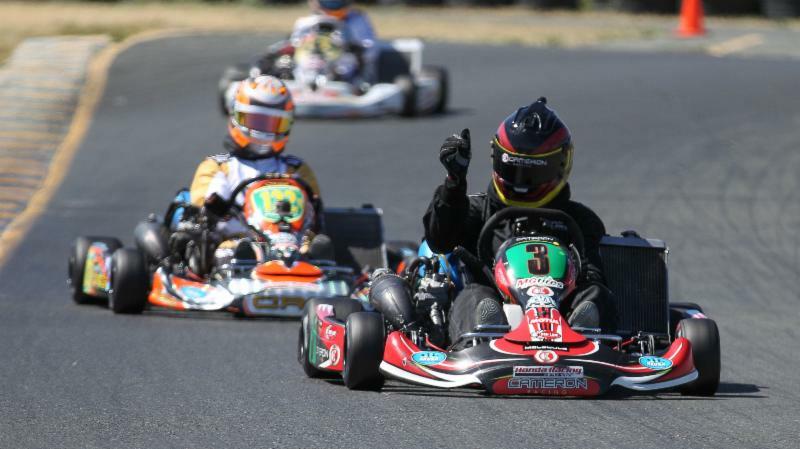 The highest placed electric kart was Ramirez in 5th with Hilleman in 6th. 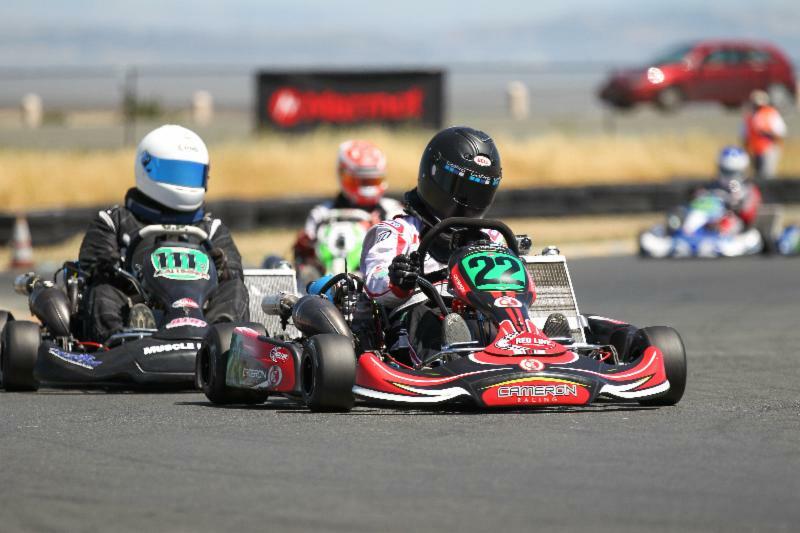 In the Main, the electric karts drove twelve laps then went to the pits while the DD2 karts went the normal fifteen laps. Colombini was not to be denied this day and took the early lead onto a six second win over Mitchell, while Eriksen came home 3rd and the DD2 Masters class win. In the EVO class, Ramirez came home with the win, Hilleman 2nd and Kenyon Kluge 3rd. 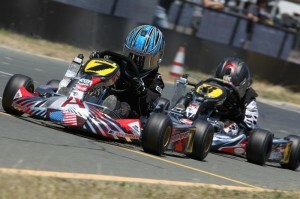 With twelve karts, Micro was the second largest class of the day. Garrette Randolph Jr took the pole ahead of Grant Langon and Emerson Action. In heat one, Garrette took the initial lead but Grant worked his way past to take the lead and the nose to tail racing began. Towards the end, Grant took the win followed by Garrette, Action and Alec Acevedo. In the second heat, Garrette again took the initial lead and held off the strong pressure from Grant to take a one second win, Grant 2nd, Action 3rd and Gino Sandoval 4th. In the Main, things went Grants way as he drove like he was on a rail. Grant took the initial lead and never looked back on his way to an eleven second victory, his first feature win in the RLOKC series. Rookie Emerson Action held off Garrette to take 2nd, Garrett 3rd, Ethan Tavares 4th and Gino Sandoval 5th. The fast veterans took to the track with Charles Hastings taking the pole ahead of Rick Gutzke and Geoff Provo. Gutzke normally runs in the Stock Honda Masters class, but his 125 kart blew up the week before, so Rick took his 80 off the shelf and came out to have some fun. In the first heat, Gutzke took the lead at the drop of the green flag and went on to the win, Hastings 2nd less than a half second back and Dave Holstein 3rd. In the second heat race, Gutzke again won the drag race off the standing start and drove home the winner with Hastings three tenths of a second back in 2nd, Provo 3rd and Holstein 4th. In the Main, Gutzke again had a very good start and went into a lead he would never give up. Holstein went into 2nd when Hastings had a slow start. Holstein over cooked turn one on the second lap and spun, ending what looked to be a promising race for him. Hastings took over the runner up spot and again got near the rear bumper of Gutzke but just could not find a safe way around. In the end, Gutzke took the win, Hastings just two tenths of a second back, Provo 3rd and Rob Mullaney 4th. Billy Scott took the pole ahead of Scott Ripslinger and David Carlisle. In the first heat, Ripslinger moved to the front early on and took the win as Kelly Heil turned up the speed and worked up from 5th to take 2nd with Scott 3rd and Carlisle 4th. In the second heat, Ripslinger again made it to the front and drove on to a two second, win followed by Scott, Heil and Bob Olson. During the Main, initially it was Ripslinger and Scott leading the field, but Heil again proved to be the fastest and was able to get by the top two to pull out a small lead. In the end, Heil was tuned to win with Ripslinger coming home in 2nd two seconds back followed by Scott, Carlisle and Bob Hurst. Qualifying for this Rotax and TaG group saw Zach Pettinicchi taking pole ahead of Austin Elliott and Pablo Carballedo. In the first heat, Austin used his experience to take the lead out of turn one. Pablo was the only one who was able to stay close to the veteran TaG pilot to come home 2nd in the heat less than a second back. Justin Ynez and Zach battled all race long and in the end it was Justin 3rd, Zach 4th and the TaG of Maxx Marian in 6th. In the second heat, Austin again went to the front early in the race with Pablo and Zach chasing. Towards the end, Austin took the win just one tenth of a second ahead of Pablo with Zach another three tenths back, and Justin in 4th. In the Main, It was Austin and Pablo all the way, the two staying very close for most of the race. Zach had a roller coaster of a race moving up to 3rd, and then over cooking turn one only to fall back to 6th, then passing his way back to 3rd only to fall back to 5th. At the end, Austin took a two second win with Pablo in 2nd, Ynez in 3rd, Zack 4th, Milas Mills in 5th and the TaG of Marian in 6th. At the end of the awards ceremony, the six winning drivers of the classes with eight or more drivers came up to the podium and Valdemar Eriksen drew the lucky driver. Austin Elliott’s name came out of the hat and he took home the $500 bonus for the race day. The next RLOKC race will be June 15 on the Reverse Sprint track layout, the GoPro feature race will be Mini Max.